this leading edge mind-healing therapy that can transform your life. Our site is currently undergoing maintenance. Please check back soon. 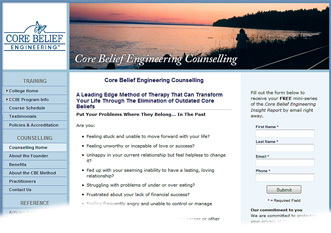 Core Belief Engineering is a holistic, transformational, results-oriented, mind-healing therapy that helps you to find and resolve the root cause of your mental, emotional, spiritual, psycho-physiological and social conflicts and limitations; many of which are beyond your conscious awareness and control. CBE helps you uncover and re-activate your innate nature: your natural strengths and abilities. Results are measured through your own empirical experience of change: i.e. your emotional responses, your level of awareness and conscious choice, your automatic behaviours and overall well-being. The approach is tailored to your needs and will permanently change your limiting core beliefs in a safe and supportive environment. 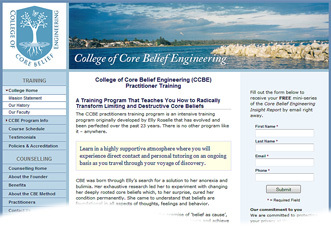 The College offers you an exciting and unique opportunity to experience and learn all of the Core Belief Engineering change processes. In the Practitioner Certification Program you get to explore and resolve core issues and grow personally at the same time as you learn the therapeutic and coaching skills to help others transform their lives. The Practitioner Certification training consists of a sequence of courses, involving coursework, theory and practicum. The skills and tools you acquire will help you to find, to know and be true to yourself; you will improve your communication abilities, enhance your strengths and talents and increase your conscious perspective and choice. Our programs support you in your current work and/or provide a new career path as a private practitioner.